Cleaning traditional radiators has always proved to be a challenge. These radiators tend to be large, obtrusive, difficult to clean… not to mention that they are a major source of bacterial issues. For thorough cleaning, they require complete disassembly with assistance from estates personnel – a time-consuming, costly and disruptive process. 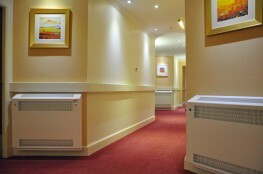 But Contour has developed a fast and easy cleaning initiative with our range of LST and anti-ligature radiator covers. 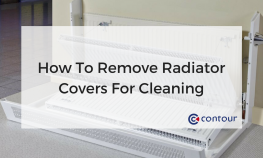 These covers (and the radiators that they protect) can be easily cleaned by one operative, with no need for assistance from estates personnel, saving time and reducing cleaning costs. Removing a Contour radiator cover for cleaning is quick and simple. Twist the simple quarter turn lock to release the casing. The one-piece door will drop down to floor level, providing full access to the floor beneath the radiator. If Rotarad valve fittings have been installed to the radiator, the radiator can also be dropped to floor level for easy access to the back of the radiator and the wall behind. Refit the door by pushing it back into place and locking with the provided key. Watch our instructional video on how to remove an LST radiator cover here. Bree bull-nosed corners prevent injury in the event of a fall. Small grilles prevent pencils and similar items being dropped inside radiator covers. The slimline design of radiator covers is space-efficient. BioCote® coverage reduces bacteria on radiator covers by up to 99.95%. Pipe boxing can be included in radiator packages. Bespoke radiator covers are also available for a range of environments. Options include wall-to-wall radiator covers, vertical radiator covers, aluminium radiator covers, alcove radiator covers, raised finned element radiator covers, corner fitted covers or bay window radiator covers. Contour’s elite radiator solutions not only protect vulnerable users from hot surface temperatures and increased levels of bacteria, they are also quick and easy to clean, further improving hygiene in healthcare, education, mental health, social housing and security sectors. Contour’s LST radiator cover range is designed to protect you and your service users. Get in touch with us to use our UK-wide free survey facility. Our surveyors will identify the size and quantities of products that you need and note any special requirements that you specify for your project. All Contour radiator guards are covered with five-year warranties. Contour is the exclusive partner of BioCote® anti-microbial technology for LST and anti-ligature radiators. BioCote® additives reduce bacteria by up to 99.9% and are combined with Contour’s extensive range of colour-paints to coat products for a durable, high-quality finish. Contour’s heating solutions offer secure, single-person quick access to radiator guard interiors for regular deep cleaning and maintenance. Each year, Contour save the NHS millions of pounds in cleaning costs, while delivering cleaner, safer environments. Contour has redefined the marketplace and is regarded by many as a design and innovation leader within the industry. Contour’s vision is supported by a quality-first philosophy and a passionate and conscientious customer focused team who possess a ‘can-do’ attitude, taking pride in developing solutions for your heating requirements. 19 specifiers have shown an interest in this product the last month.